Ever feel like you’re somewhere where you shouldn’t be? Yesterday I was running on the Coal & Coke Trail outside Mount Pleasant when I found myself in the midst of hunting season in Western PA. Orange-clad hunters with rifles patrolled the woods on either side of the trail. This isn’t abnormal this time of year…after all, the PA hunting season is short and the interest, strong (i.e. supply and demand sends hunters and the hunting-inclined out in droves), and I’ve certainly seen hunters out and about during my daily runs. But I felt particularly vulnerable this time around. Yeah, I was wearing bright red and running in a b-line down a wide jogging trail, and I realize that hunters for the most part are very careful with their rifles. Most of the hunters I saw even acknowledged me with a hand wave or a tip of the cap. For Holy Thursday a bunch of gathered at an Immigration and Customs Enforcement (ICE) detention center in Cary, North Carolina, and held a footwashing worship service—we told them we wanted to wash the feet of the people detained inside. If you haven’t heard about these ICE detention centers, that means the federal government is good at what it does: Obama is turning out to be just as good as Bush in keeping secrets from U.S. citizens. ICE sets up field offices in unmarked buildings, tucked away in business parks throughout suburbia. Once citizens find out about a particular site, ICE closes up shop and moves to another unmarked building, tucked away in one of the other many business parks in a different suburb. The detention center in Cary we visited is next door to the offices of Oxford University Press, the publisher of many of the books on my shelves. (For more information on ICE detention centers, read this article from The Nation: America’s Secret ICE Castles). This chair here will remain empty as a sign of all the bodies that the department of Immigration and Customs Enforcement have hidden from us, the bodies that law enforcement agents have torn from our communities and our families in the middle of the night, the bodies that they have ripped away from our churches. By refusing to let us wash the feet of the people hidden in their detention centers, the federal government has dismembered the body of Christ, they have torn apart the church, they have pierced and severed the body of Jesus. It’s someone else’s problem…or it’s not. We Were Here First! Right? 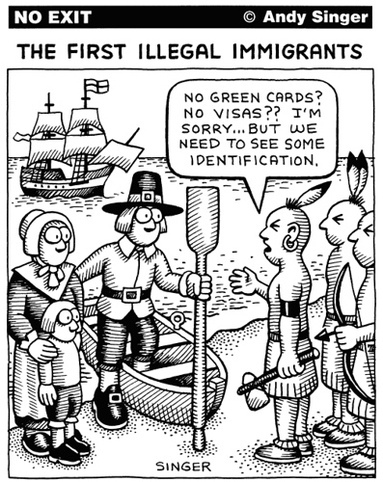 Illegal immigration. That raises feelings in the hearts of alot of us. There are strong feelings on both sides of the debate. If you do your homework, it makes this debate a whole lot less easy. There has been a few things nagging at me and I just can’t shake it. Would you like to hear what they are? First off, most of us European Americans fled our countries in search of freedom from our oppressors. The pilgrims were in search of religious freedom from the church of England. Even our Mennonite ancestors sought out freedom. Dutch, Swiss, German and many others were seeking solace and safety in a new land. It wasn’t as if this land wasn’t occupied already. Of course, we all know that there were indigenous people here long before we ever arrived. No, this isn’t one those questions intended to corner pacifists. This is a question that I actually have, based on experience I actually experienced, and a question I would actually like to have an answer to, although I understand that a solid answer to what I am pondering is allusive at best.